As most know AutoCAD 2008 was released about 2 weeks ago on March 23. Perhaps the most exciting new feature in AutoCAD 2008 is what is known as “Annotative Scaling”. I have often referred to the 2008 release of AutoCAD as the “your wish is now a command release”, and Annotative Scaling is of the wishes that have been made a command. Using AutoCAD releases prior to 2008 it was common to copy text for printing at different scales. A common one in Civil engineering is 1″ = 50′ for design sheets, and 1″ = 100′ (or larger) for overall sheets. Of the challenges of having multiple copies of a single note is keeping each copy in sync with the other when revisions are made. The idea behind Annotative Scaling is that you can have a single piece of text which will scale itself up or down based on the scale of your drawing. While powerful the concept and use of Annotative Scaling can be rather complex. A number of pieces must come together in order for Annotative Scaling to work properly. The cool thing is, while I will only focus on text, lots of things including blocks can be Annotative. 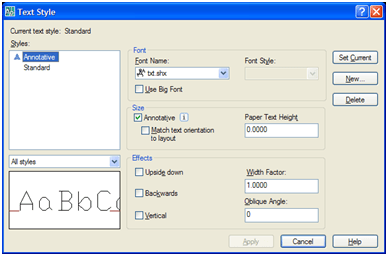 AutoCAD 2008 introduces a new Text Style dialogue. This change is due in part to the introduction of Annotative Scaling. The key to making text magically scale itself is to make sure the “Annotative” checkbox is checked. For years we have had to calculate the height of text by doing a calculation such as (Plotted Height X Drawing Scale = Model Space Height). In other words if you were working on a 1″ = 50′ drawing and wanted your text to print at a height of 0.1″ you would; 0.1 in. x 50 ft.= 5 ft.. If all of that math confused you, well you’re not the only one. The new Annotative Scaling feature is all about making it so you don’t have to think about anything other than you want your text to plot out at say 1/10″ tall. 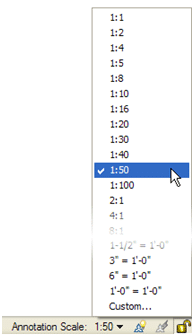 When the Annotative checkbox is checked the “Height” field changes to “Paper Text Height” (illustrated above). Once again this value is going to be the height you want your text to print out at on paper. You’ll notice I have entered 0.1 in the illustration representing a 1/10″ plotted height. Just as you were beginning to master system variables such as LTSCALE and PSLTSCALE AutoCAD introduces another to us â€“ CANNOSCALE. This new system variable controls how your text will appear in Model space. For instance, if the majority of your plan sheets were at a scale of 1″ = 50′ then you would likely set CANNOSCALE to “1:50”. Assuming you set your Paper Text Height to 1:50, your model space text will be scaled 50x, and consequently appear to be 5′ tall. If you have taken a look around your AutoCAD 2008 interface you have likely noticed one addition to the Status Bar at the bottom of the screen. These additions have to do with the new Annotative Scaling feature. Instead of typing CANNOSCALE each time you would like to change the Annotation Scale, you can simply click the scale listed on the Status Bar. Clicking the scale will result in a list of available scales being displayed as illustrated to the left. Keep in mind that the Annotation Scale is more or less for reference purposes only. Annotative text displayed in a viewport will be scaled up or down per the viewport scale. Thus it is possible for a single piece of text to be scaled to a height of 5′ in a 1:50 scale viewport, and 10′ in a 1:100 scale viewport. People who have used AutoCAD Civil 3D in the past will be familiar with the way text can magically scale itself. While Annotative Objects work in much the same way as Civil 3D objects, there are some differences. Figuring out how Annotative Text works can take a little time, but after only a short period of time you’ll find yourself asking “where has this been for the last 21 releases of AutoCAD”. In some future posts we’ll take a look at some of the other things Annotative Text can do. Donnie – What you guessed at seemed to have been one of my problems the other seemed be that the block would only work correctly when inserted into a clean drawing. But have spent a few free hours playing with the annotative tools I feel I’ll be able to finally make some proper use of them. My advice to anyone else is to stick with it for a few hours as it will eventually become clear how to use this very useful tool. My only wish is that Autodesk provided some sensibly clear instructions. @Philip – My first guess is that one of your scales hasn’t been assigned to your block. By default, annotative objects only display at the scales you tell them to display at. There’s a right-click option when you select an annotative object that will let you add/delete scales. Your other option is to use the lightning bolt annotation icon. Turn it on in model space, and change your annotation scale to the scale you want to add to each of your annotative objects. I have a question on annotative blocks etc. I have set up a simple test block with a couple of objects some annotive hatch and some annotive text. The block was created with annotative behaviour. When this block is inserted into a drawing and 2 differently scaled viewposts (1-20 and 1-5) are created the view of the block should represent the the scale of the viewport. My problem is that the 1-5 viewport is the same as the 1-20 viewport. I have checked that both viewport are scaled correctly which they are and they are locked too. So I’m lost as to what’s wrong with what I did. If you have annotative text in drawing, it takes too long to save and open a file. How this problem could be solved? Shiva – First thing to consider is if you have the lightning bolt annotation scale icon turned on, each time you change your annotation scale you’re also adding that scale to every annotative object in your drawing. If you’ve added a bunch of scales to your annotative objects, that can cause some performance issues. The final bit of advice I might offer has to do with a setting in the OPTIONS command. There’s a setting “Maintain visual fidelity for annotative objects”. Unless you’re exchanging your files with people running 2007 or earlier, you can probably get away with turning this off. Annie – Couple things you need to do… First be sure to add a 1/4″=1′ and a 1/8″=1′ scale to your text. If your annotative objects don’t have both scales things can get a little goofy. Next take a look at your viewport. Make sure both the VP scale and Annotation scale are the same. It’s possible to have a viewport scale of 1/4″, but an annotation scale of 1/8″. If you have text that is 4″ in model space and has annotative properties and you create a viewport in paper space that is 1/4″ and another one that is 1/8″ and you apply the annotative paper scale height of 4″ the text gets huge. How do I maintain the 4″ height in model space but keep the text the same size in paper space at both viewport scales. How can you (programmatically because I need to adjust about 25,000 dwg files…) get the CANNOSCALEVALUE to egual the VPSCALE for paper space viewports in legacy AutoCAD 2007 drawings?? I dare say that anyone confused by a simple multiplication operation such as ab=c probably shouldn’t be doing engineering drawings. Peter it sounds like you might be a pompous prick. Everyone is capable of learning with the right training. Mocking people only insinuates you are not very secure about your own intelligence.